2. 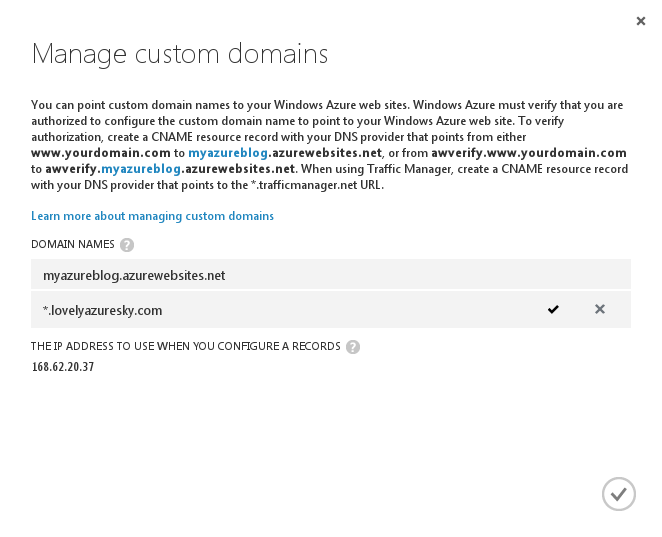 Before proceeding to the next step, use the NSLOOKUP utility or PING to confirm that your wildcard domain resolves to Azure correctly (as in, any subdomain under lovelyazuresky.com would resolve to an Azure URL similar to the below). If it doesn’t, wait a while and try again. Until the record resolves correctly, you will not be able to proceed. Since you already configured the CNAME record, the verification should succeed and the checkmark on the right would appear to confirm it. If you receive an error, give it a little time – it could take up to a few hours for the DNS record to be created with some domain providers. If after a few hours you still cannot add the domain, contact Microsoft support for help. After the configuration is saved, the domain is ready for action, and all first-level subdomains of lovelyazuresky.com will point to the site. Adding SSL If you also want to add an SSL binding to the wildcard domain, the certificate must be a wildcard certificate to cover the full breadth of the wildcard domain. Both SNI SSL and IP SSL bindings are supported. When everything is done, the SSL configuration will look like the image below. 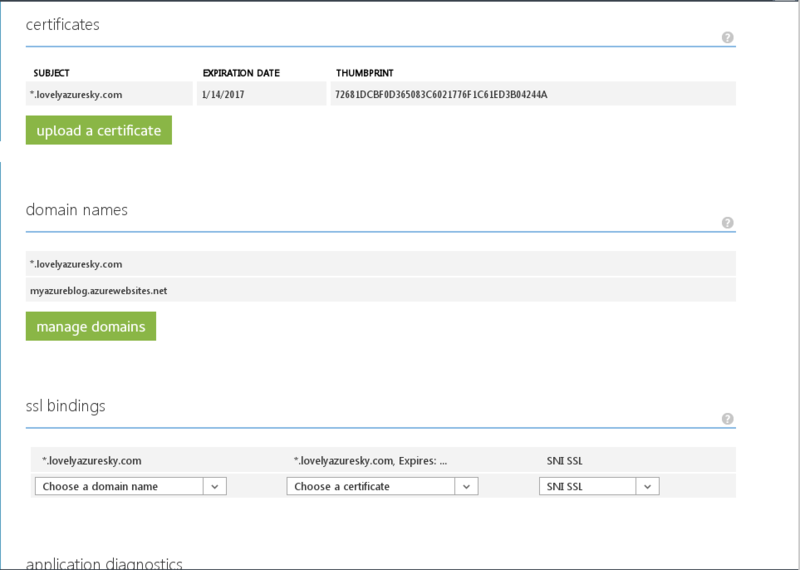 What if we want to use a different binding and certificate on one or more of the subdomains? This can be done in a natural way by adding (for example) payments.lovelyazuresky.com to the site and creating an SSL binding on it, which for this subdomain will override the wildcard binding on *.lovelyazuresky.com. You can even do this across multiple sites, allowing specific subdomains to go to a totally different site with a different SSL binding.